"The ShopforEthernet.com agent program is unique in that we provide our agents with software that allows them to perform research in seconds instead of weeks. Add to that warm leads and top commissions and you have an agent program that people can't pass up." Here at Telarus, parent company of ShopforEthernet.com, we pride ourselves on our ability to partner with diverse	and unique companies within the telecommunications industry; especially those whose focus is Ethernet and other "up stream" services. Our IT department has produced many cutting-edge software solutions that make it easy to do business with us, whether you are a one-man-shop or a Fortune 100 company. Use the links we provide you below to learn more about the programs and software we have created to expand your business. 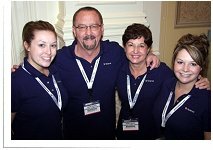 Melissa, David, Cheri, and Teresa Leach work as a team to contact, follow-up, and answer questions of customers who come to ShopforEthernet.com. The real strength of Telarus resides in the quality of agents we work with. This is not clich? Telarus has attracted some of the brightest, honest, and most integrity-filled agents in the industry. This "honor code" allows agents to partner with one another to close deals and split the commission accordingly, it allows them to receive warm leads generated by other agents, and it allows them to offer honest feedback to the IT staff at Telarus on the performance and utility of the software we create. Telarus is more than a "contract shop" that pays the "highest commission" and offers the "lowest rates". We offer our agents true value: software, support, and a sense of family. If you are interested in becoming a member of the Telarus agent family, please call (877) 346-3232 for a personalized tour of the agent back office and explanation of our award-winning program. One of the main focuses of Telarus is Value Added Resellers and Network Integrators. We understand that a meaningful relationship consists of more that just an occasional plea for new business. Our VAR Network program allows our agents to recruit VARs into one main pool, and drives equipment leads to these VARs based upon their individual qualifications and preferences. We currently specialize in generating leads of people looking to buy Avaya, Cisco, NEC, Mitel, Nortel, ShoreTel, Polycom, and more. If you are a VAR and are interested in joining our VAR Network, please call (877) 346-3232 for a detailed explanation on this unique program, including a WebEx tour of the VAR Back Office.